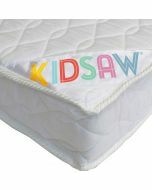 This cot mattress is made with Combustion Modified High Resilience Foam and traditional springs to comply with Government Regulations of Ignition and comes with all the relevant BS standards. It is free from antimony, phosphorous or arsenic fire retardant chemicals. Always ensure a good close fit of the mattress in the cot. 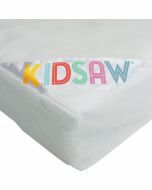 This cot mattress is made with Combustion Modified High Resilience Foam and traditional springs to comply with Government Regulations of Ignition and comes with all the relevant BS standards. It is free from antimony, phosphorous or arsenic fire retardant chemicals. Always ensure a good close fit of the mattress in the cot. Air all bedding, in particular the mattress, as frequently as possible. Mattresses are breathe through. 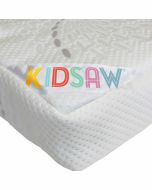 The cover is fully overlocked and is made from deluxe quilted coroquilt. Also the cover can easily be removed for washing by means of the zip. Hand wash or gentle machine wash (maximum 60 degrees) in a mild detergent and rinse thoroughly. It is recommended that you turn your mattress frequently.